24 Elizabeth Street. City of Toronto Archives, Fonds 1268, Series 1317, Item 379A. 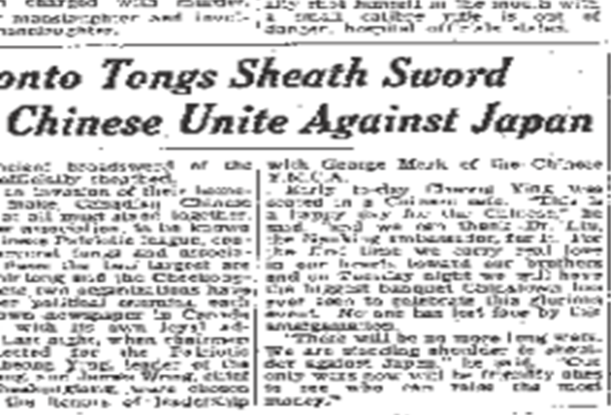 Toronto Tongs Sheath Sword Chinese Unite against Japan.” The Toronto Star 18 Feb. 1938: 1. 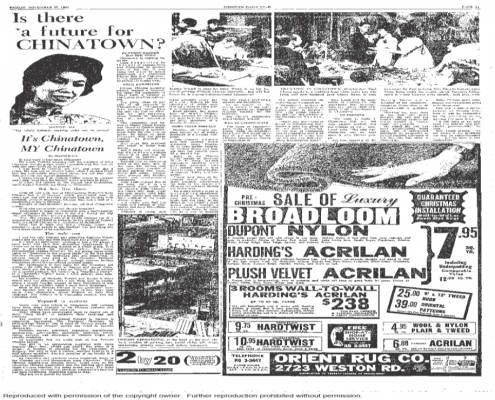 ProQuest Historical Newspapers. Web. 9 Feb. 2015. “Page 51.” Toronto Daily Star (1900-1971): 51. Nov 27 1964. ProQuest. Web. 13 Mar. 2015 . “Jean Lumb, Citizenship judge”. 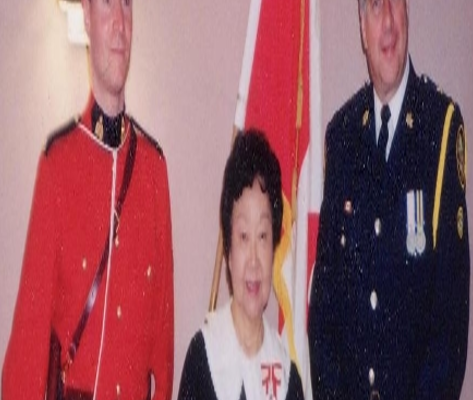 The Jean Lumb Foundation, jeanlumbfoundation.ca. Web. 12 Mar. 2015. Chan, Arlene. 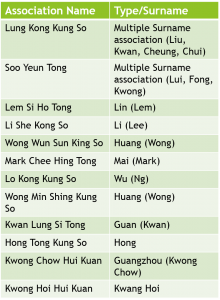 “Table 8; Clan and District Associations in Toronto, 1910.” The Chinese in Toronto from 1878: From Outside to Inside the Circle. Toronto: Dundurn, 2011: 54. Print. 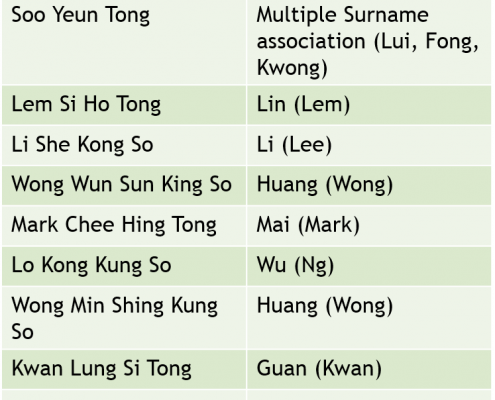 Many political associations in Chinatown, though not directly tied to family groups, were often “headed up” by leaders of prominent family associations as well (Chan 56). Due to this, any problems between different families ended up becoming problems between political groups as well. However, these differences did not prevent the families from coming together when they needed to accomplish something. This was best seen during World War 2 and when the City of Toronto was attempting to retake the land that Chinatown occupied to build a new City Hall. 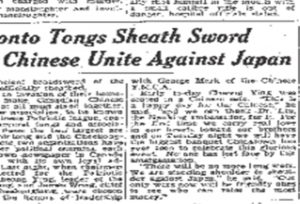 ““Toronto Tongs Sheath Sword Chinese Unite against Japan.” Toronto Daily Star (1900-1971) 18 Feb. 1938: 1. ProQuest. Web. 9 Feb. 2015. 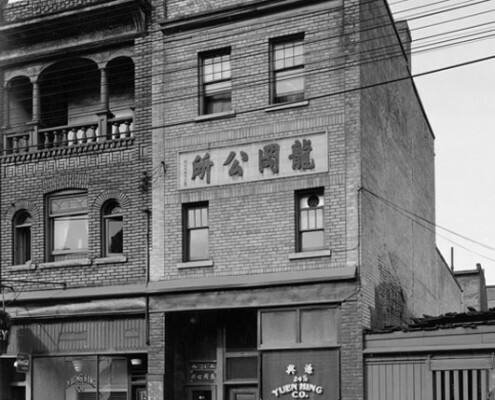 Eventually, city council decided to take over the land that Chinatown occupied in order to build a new city hall. 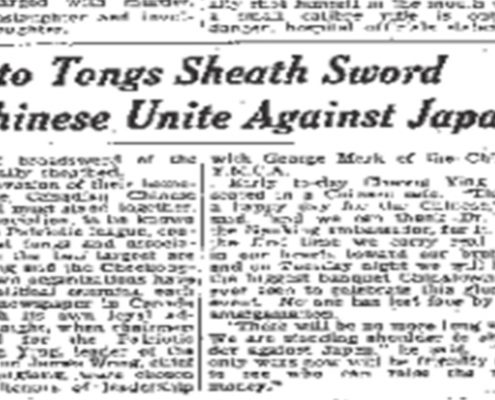 After the decision was made, there were serious concerns over whether Chinatown would be able to survive. 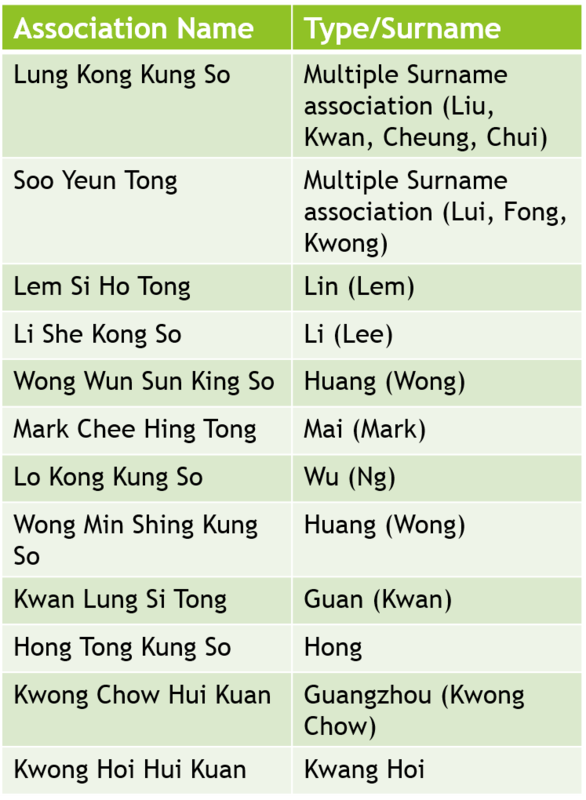 Before the final decision was made, all of Chinatown’s political, family and community associations worked together in order to save their shared community. One of the most prominent figures in the campaign to save Chinatown was Jean Lumb (Toronto Star). 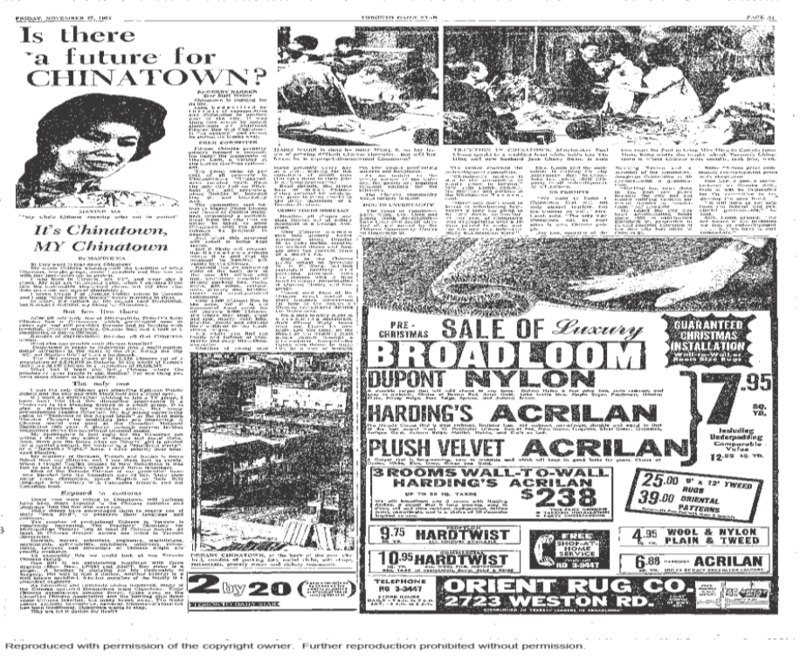 “Is There a Future for Chinatown?” Toronto Daily Star (1900-1971) 27 Nov. 1964: 51. ProQuest. Web. 27 Feb. 2015. Jean Lumb as a Citizenship Judge. Photograph. Jean Lumb Foundation. The Jean Lumb Foundation, n.d. Web. 12 Mar. 2015. I found this assignment to be very eye opening. 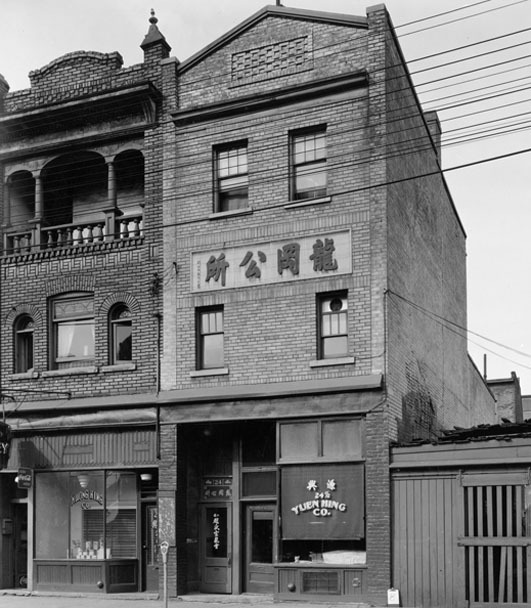 I would never have guessed how much history and information there was with regard to our first Chinatown. Since this was a required course for school, I didn’t think that I would gain anything important from the class…but I couldn’t have been more wrong. 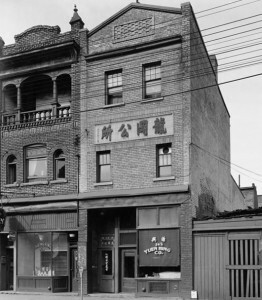 From the first class, we began examining not only Toronto’s Chinatown but the treatment and presentation of the Chinese community as a whole in the early twentieth century. 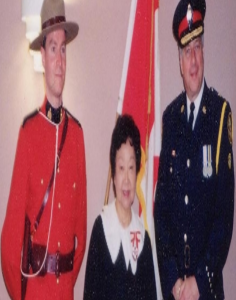 After talking about this and other issues that related directly to Toronto’s Chinese community, my interest in the class increased and I looked forward to researching more. This course required me to expand my research skills and explore more areas of research (like the Toronto Archives and the Reference Library). I am extremely thankful for this opportunity to share my research in a public setting and, hopefully, spark another person’s interest in finding out more about Toronto’s first Chinatown. Kieran Etheridge is a second year English student at Ryerson University. This exhibit is the final project for ENG 390, a practicum course focusing on Toronto’s original Chinatown. “Ease Entry Into Canada Chinese Ask.” Toronto Daily Star (1900-1971) 23 July 1963: 12. ProQuest. Web. 24 Feb. 2015. 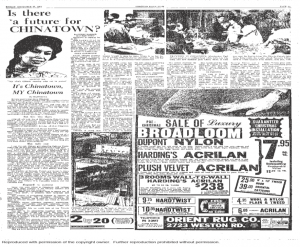 “It’s Chinatown, My Chinatown.” Toronto Daily Star (1900-1971) 27 Nov. 1964: 51. ProQuest. Web. 13 Mar. 2015.